So yesterday Scott Karp goes and announces a new social news service based around journalists. It won’t be up and running for a while yet, but he wanted to build buzz, and it seems to have worked. Synopsis: Why develop a service for journalists to help filter the news that’s already out there, when we could have a peek behind the curtain to see what journalists are working on? Publish2 should let us see tomorrow’s news today. Synopsis: Journalists should be using social networking tools anyway. Synopsis: Why’s everyone trying to “build a better Digg?” Digg’s not broken. It serves its audience quite well. Synopsis: Aren’t journalists already news aggregators, consuming large amounts of information and passing the most interesting bits on to their readers? 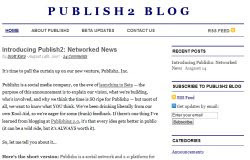 All of which is to say, Publish2 might be a great idea. Or it might be redundant. But until it actually launches, it will be hard for journalists to decide if it adds any value to their daily routines or for news consumers to decide if it helps keep them informed. Maybe Karp made his announcement a bit too early. Since it’s not ready to launch, it’s hard to describe exactly how the service will work. But by the same token, it’s not too late to retool Publish2 in order to take criticism and advice into consideration. Karp left a comment on at least one of the above blogs suggesting that he’ll consider implementing some of the author’s suggestions.